Big stingray fishing mae klong River Thailand. 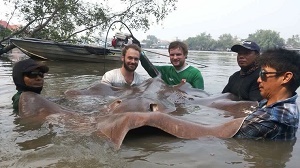 Two European anglers after bagging up at Palm Tree Lagoon to decided to visit the Mae Klong River fishing for stingrays. On arrival the anglers were soon fishing near the estuary with large baits positioned at intervals across the river. The anglers fished several different areas before finally locating the stingrays in a wide part of the river. On winding down into the unseen Giant freshwater stingray the anglers were greeted by an extremely powerful fish which charged off downstream. After being pulled for some distance by the stingray the fish went to ground embedding itself into the muddy riverbed. An epic battle followed which lasted over an hour before the stingray was finally beaten. After bringing the big stingray over the net and securing it alongside the boat it was quickly transported to the riverside. With a width of 2m’s the Giant freshwater stingray was estimated to weigh 225kg before being released back into the river.